Today I feel like posting an old post. The post below was written in 2012. I feel it’s just as valid now as it was back then. Today I’ve been talking to a few people about aspect ratios. Since I wrote this piece, I’ve seen a few camera manufacturers offer more aspect ratios in their cameras, but it’s still not enough. Aspect ratios should be programmable on all contemporary cameras. It should also be implemented in a way that works without it being a bit of an afterthought (Canon, Nikon). Through the more recent introduction of mirrorless cameras, some have embraced aspect ratios (my favourite is the Fuji GFX50s which has just about every conceivable aspect ratio available, and it can be programmed as a dedicated button on the body). Anyway, I hope you enjoy this article about me shooting images in Scotland. This past weekend, I was in Torridon conducting a weekend workshop. We had some very rainy weather, and one of the group - Steve - mentioned to me that he was glad the weather had been bad, as it gave him a chance to see he could actually make some good images despite the weather. I often feel, that the reason why Scotland is so photogenic, is because of the changes in the weather. One minute it's misty, the next it's clear. And fog or low cloud levels can be a great way of making simpler images. Take the shot above for instance. This is Loch Maree. Normally, this group of trees have the massive Slioch mountain dominating the background. But with a bit of rain and poor visibility, Slioch was invisible. We were left with no horizon - nothing to give the shot context. I loved the group of three or four trees clumped together. They were actually a subset of a larger group of trees, but I felt that we could easily 'remove' the rest and keep the entire shot very simple if we just had this small gathering of trees. I made this shot on my little Lumix GF1. It's a great camera because it has interchangeable aspect ratios. I felt that square worked really well for this shot, as I could easily place the trees in three quadrants of the frame - top right, bottom right and middle right, as you can see in the above triptych. Question is, is one better than the other? And I like to consider that there is always more options than just one. So I guess the answer is 'it depends'. My personal favourite composition out of the three images is the first one. I feel the picture has a more 'uplifting' feeling than the rest, and it has more presence, because I'm really exaggerating the empty space in the frame more than the others. I also love the reflection of the trees.... I feel they have space below them to 'breathe'. The middle composition, where the trees are placed in the bottom right, is perhaps less engaging for me, because the trees aren't so tight against the bottom of the frame. The picture feels less focussed for me, in terms of composition. I'd liked to have moved the trees even further down the frame, but I felt the reflections would not have enough space. I felt I had to keep moving the trees further up the frame. But it's a more relaxed composition than the first one - which I feel is more 'graphic' than being a photograph. The far right composition is perhaps my less favourite. It is more of a 'standard' composition. I feel the horizon has been carelessly composed - for my taste. It's just a little below centre, and I think it might have benefited from being slightly above centre - giving that 'uplifting' feeling I was talking about in the first image, while at the same time, being more in-line with a 'standard' landscape image. As much as I love square, maybe it might have suited more a 4x5 aspect ration as seen above? Ultimately, when you have a simple subject such as this - trees and reflection, and nothing else, it's much easier to get down to the basic tasks of composition and placement in a frame. The less objects you have in the frame - the better, I feel. I was immediately attracted to this scene when we were driving past, because there's little in there to distract. When was the last time you went out with your camera to shoot when the atmospheric pressure is so low, that almost nothing is visible? Osmosis - A gradual, often unconscious process of assimilation or absorption. Some landscapes come to us when we are ready to receive them. Not the other way around. Lumix GX1, 12-23 lens, Lee 0.9 hard grad. This image was taken quickly to illustrate compositional and tonal relationships during my weekend workshop. Last weekend I was running my umpteenth workshop in Torridon - a very special mountainous place here in the Scottish highlands. This has often been a case for me whilst running my workshops. I discover that I knew something I didn't know I knew. And also, that through the process of having to explain something to someone else, my own understanding of a place, or a photographic concept becomes clearer. I've found teaching workshops in Torridon immensely rewarding in this respect. The landscape is fractured and complex. It is not a simple landscape to make good images from, and it requires you to see that many of the stones, trees and bracken all have similar tonal relationships. When these tones are compressed down into a 2D image, they often merge, and become very confused and jumbled as a result. 'Separation' between objects within the frame becomes key. Through this awareness, my eye has become more finely-tuned. The image you see at the top of this post was made last weekend while we were busy trying to work with competing elements. It has taken me around 13 years to get to a point where I can look at a scene and know how best to deconstruct it down to a few elements that will work as a photograph. Through this time, I have often asked myself questions about my work, and I've often had to explain it to others. As creative people, we have to listen to ourselves and become more aware of our own thoughts. It is only through a sense of internal-dialogue, and a sense of inquisitiveness about how we choose to approach landscape photography, that we are able to progress as artists. In the video above, you'll see Brian Eno and Ben Frost discuss the creative process. I found it fascinating to hear Ben mention that he finds his work seems to be a kind of diary. I think this is true of my own photography: my images are a sounding board that show where I was, creatively speaking. They are a record of my photographic development. Ben is in-tune with his creativity - he understands where he has been and where he is now. This is perhaps a fundamental skill that all creative people should possess, or at the very least, be learning to tune into. One of the main aspects of composition, that I like to cover on my workshops, is that of separation. Separation? What exactly does Bruce mean? I hear you say. Take the image above. One of the most common compositional mistakes made by photographers is that of overlapping objects so they become indistinguishable from each other. I can think of many images I've seen of Uncle Norman with a tree sticking out of his head, because the photographer, didn't appreciate that when the tree behind his uncle, and his uncle, once flattened down to a 2D image, would become one object - that of Uncle Norman with a tree growing out of his head. Separation is the act of identifying objects in the frame and giving them enough body space, so that they don't encroach on other object, or cause tonal conflict. As photographers, we have to think in 2D. Thinking in 3D means that it's all too easy to see two objects and distinguish between them. Once flattened down into 2D, if they have the same tonal range to them, they can very easily become one confused mass. Consider two stones of the same texture and shade, and if one is right behind the other, then once flattened down, they become one big confused lump of similar texture and tone. When I made the picture of the tree at the edge of Loch Lurgainn, I noticed that the reflection of the mountain had the same shape as the outline of the tree. A decade ago, I'm sure I wouldn't have recognised the relationship, and I wouldn't have been considered about where to place the reflection and the tree in the frame. Well, it's certainly something I'm very aware of these days - and if I see any 'echo' like this in the landscape, I try to utilise it. In the case of this image, I spent quite some time moving my tripod around on a steep embankment, so that I could have the outline of the tree fit snugly into the crest of the mountains reflection. In terms of separation, I made sure they did not overlap, because they would have created a form of tension that would have rendered the image a failure. The degree of separation between tree and mountain is very small though - because I felt they fitted together like a jigsaw, and should be photographed to illustrate this tight relationship. 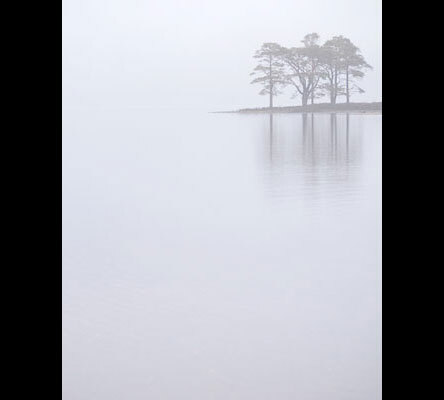 We arrived at the edge of Loch Maree in what I can only describe as 'gloom'. We'd suffered with a lot of rain for the entire day and things didn't look promising for a decent evening shoot. But if you don't go, you don't get, and in this case, what Steve found was that the backdrop of misty rain on the loch. Yes, the sky you see in this photo isn't sky - it's the loch. I've been to this location on countless times now, as I take most of my participants on the Torridon weekend workshop here, but I've never seen a photo like this until this weekend. I believe it happened mainly because of the atmospheric conditions. If we'd had more visibility, the loch would have been less diffused, and as a result, would have been more attention seeking. But Steve had also taken what I'd been explaining about separation to heart and deliberately placed the smaller tree under the arm of the larger tree. I remember him scanning through his 5DM2 on location and showing me other examples. It's always a great feeling to know that someone has not only picked up what I've been trying to teach, but has discovered material out in the landscape with which to apply it to. I'll discuss more about this image in a few days. I'm in Torridon right now conducting a workshop with a group of six. This morning, we went out in one of the most beautiful days I've seen in Torridon for a long time and Hartmut, one of the participants made this image of some of us at Loch Clair (please click on the image for a much larger view). Hartmut seemed to be much more interested in documentary shots (he was always photographing me during my talks), that I felt perhaps that Landscape was maybe not so much of an interest for him. But I'm very taken with this shot - it's a really nice blend of someone's interest in both documentary and landscape photography. Many thanks to Hartmut for allowing me to show this image (and not incur any special license fee that he keeps joking with me about). It was a great trip and as usual, the weekends are simply far too short. It's always a blast for me if the folk on the trip are willing to get into the trip and for that, I'd like to thank Fiona, Linda, Hartmut, James, John & Neil for coming along and creating such a nice group environment. 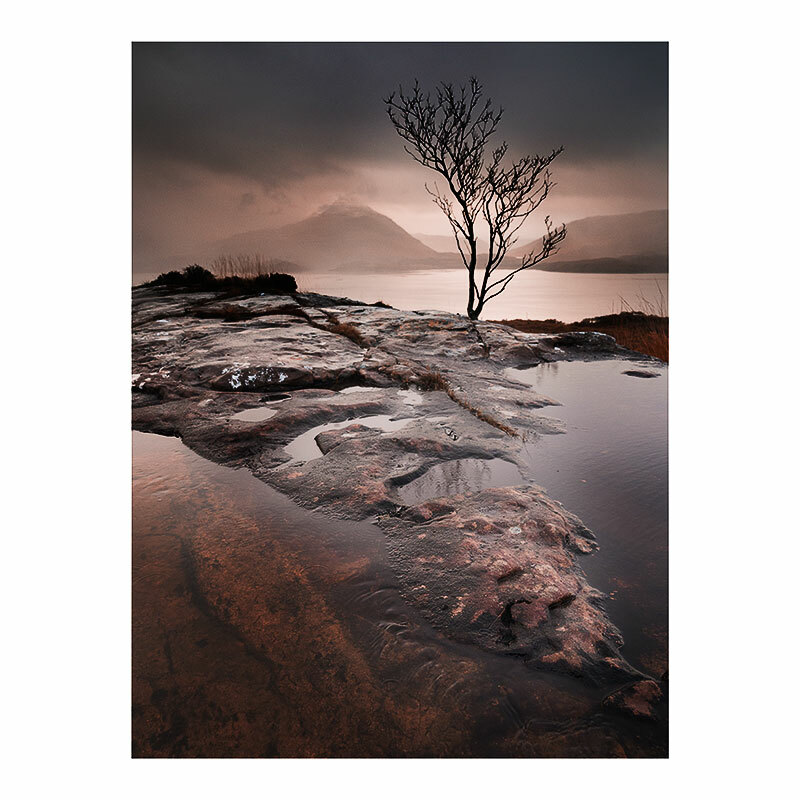 Taken this February in Torridon on a week workshop. We went looking for some more locations and found this vantage point at the edge of loch Sgamhain.